Slides: From the drop-down, choose to print all slides, selected slides, or the current slide. Or, in the Slides box, type which slide numbers to print, separated by a comma. Print Layout: Choose to print just the slides, just the speaker notes, an outline, or handouts. The Outline prints only the text in the slides, without images. 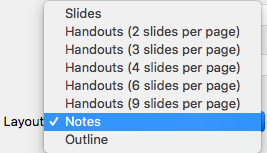 The Notes of a presentation show the slide and the related speaker notes below it. If you choose to print Handouts, you can print several slides on one page using a variety of layouts, some with space for note-taking. Collated: Choose whether you want the sheets collated or uncollated. Color: Choose whether you want color, grayscale, or pure black and white. 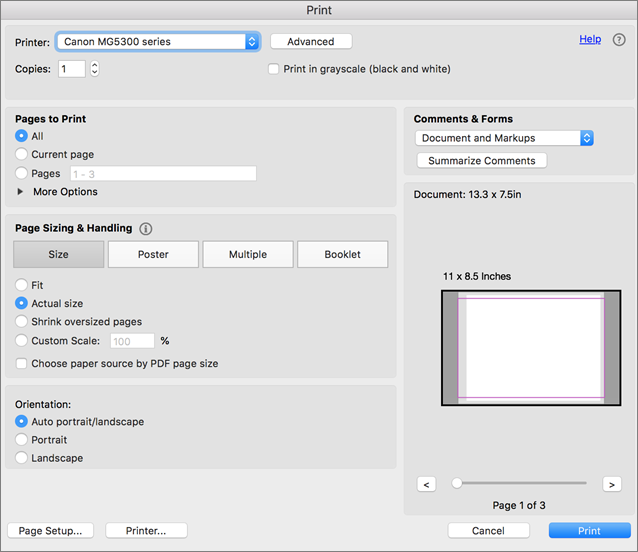 Edit Header & Footer: Select to edit the header and footer before printing. 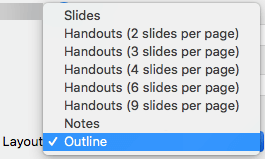 For printing in PowerPoint 2007, see Print your slides in older versions of PowerPoint. By default, in PowerPoint for Office 365 (beginning with version 1810), printed handouts include a slide number below each slide image. You can turn this option off by going to File > Options > Advanced > Print. 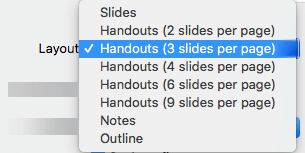 Clear the option named Print slide numbers on handouts. The following procedures cover printing in PowerPoint 2016 for Mac and newer versions. 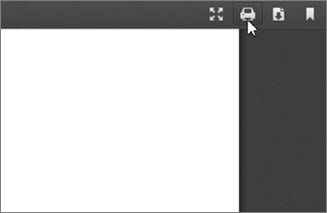 For printing in PowerPoint for Mac 2011, see Print your slides in older versions of PowerPoint. Select Show Details at the bottom of the dialog box. In the Layout box, select Slides. In the Layout box, select Notes. In the Layout box, select Outline. 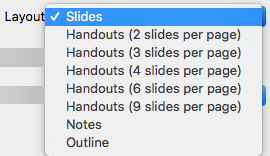 In the Layout box, select one of the Handout options, depending on how many slides per page you want. 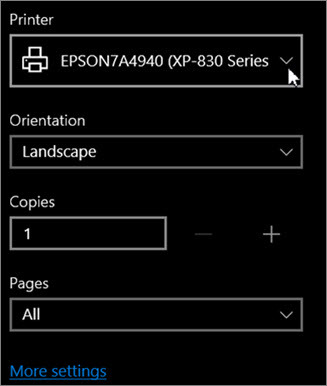 For files stored on OneDrive, OneDrive for Business, or SharePoint Online, you can print slides, notes, or handouts. A Notes Page prints the slide on the upper half of the page and the related speaker notes on the lower half. A Handouts page consists of three slide thumbnail images on the left side and several printed lines for note-taking to the right of each thumbnail. 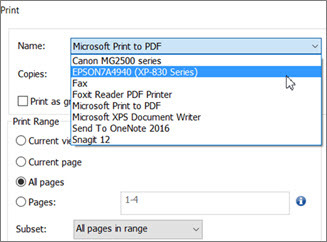 To print handouts in other layouts, see Print handouts using Adobe Reader. 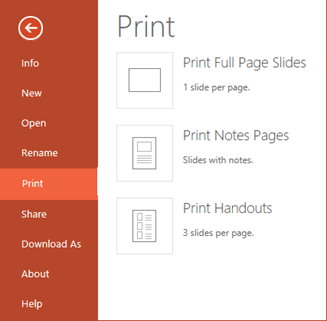 To get more advanced printing layout options, use a desktop version of PowerPoint. Wait for the Print panel to open. Wait for the Print dialog box to open. Under Printer, choose a printer. Click Print to print your slide show (you might have to scroll to find Print on the print panel). Click the printer icon in the upper right above the slide show. 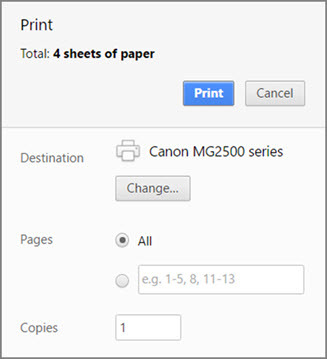 In the Print dialog box that appears, under Printer, choose a printer. Click OK to print your slide show. 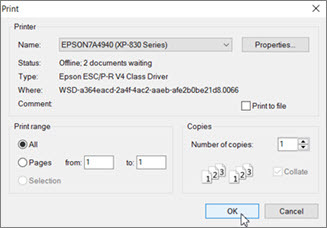 When you are finished printing, close the PDF file that was opened for printing in step 2. 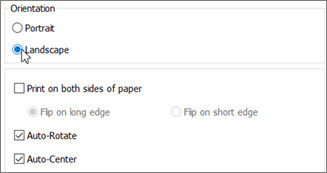 We recommend using the Microsoft Edge web browser instead of Internet Explorer when you're working in PowerPoint Online for a smoother experience when printing. If you're using Internet Explorer, we recommend that you install Adobe Reader, because having it installed on your computer makes the printing process in PowerPoint Online easier. On the Print page that appears, under Orientation, click Landscape. Set any other print layout options you want. In the Name box, choose a printer. Click OK to print your slide show (you might have to scroll to find OK on the print page). 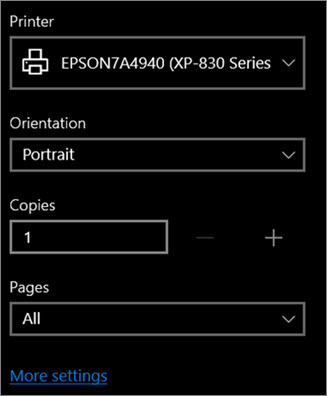 From your PowerPoint Online slide show, click File > Print and then choose the kind of sheets you want to print: . From the open presentation hover your pointer over the bottom of the presentation and click this image. 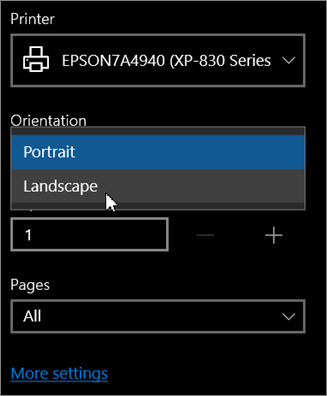 In the Print dialog box, under Orientation, click Landscape. Set any other print layout options you want. In the Printer box, choose a printer. Click Print to print your slide show.